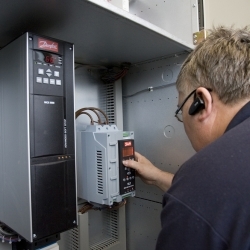 We offer a wide variety of services to help keep your units in perfect working order. 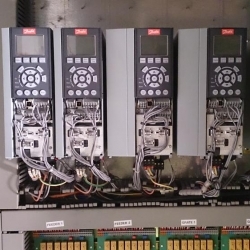 Once installed an inverter or soft-start needs to be programmed to set up input/output interfaces, ramp rates and application functions. K2 Drives' skilled engineers do this daily. A correctly optimised drive reduces running costs and delivers longer motor life. Once commissioning has been completed K2 also provide training to instruct key members of staff on the details of operation and servicing issues. Together with fault-finding skills they can react confidently in the rare event of a failure, trip or alarm condition. K2 Drives can quote, for a PM (Preventative Maintenance) contract. This contract provides for varying levels of cover depending on your requirements, from a simple annual inspection to a fully comprehensive service and maintenance package. We offer 24 hour national service support and can provide service coverage round the clock, including replacement New-For-Old and Service Exchange units up to 90kW, usually ex stock. Service Contracts with preventative maintenance visits are also available. Our cost effective, responsive on-site service carries out all activity to the highest standards following manufacturers' procedures. Same day and weekend callouts can be arranged at extra cost. 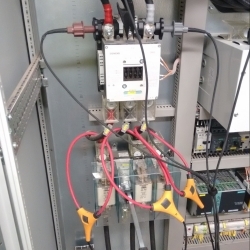 The most cost effective way to get your equipment running again. 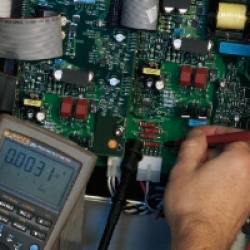 As a competence centre we can test and repair your inverter at our facility. When sent to us we will assess each repair before sending you a quote. 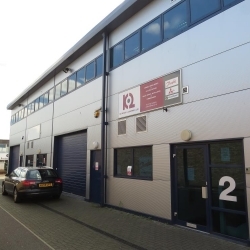 We also provide you with the cost of a replacement unit making it easier to break down any costs, and deciding the most economical way forward. Danfoss is a global leader within energy-efficient solutions that help save energy and meet the challenge of climate change. 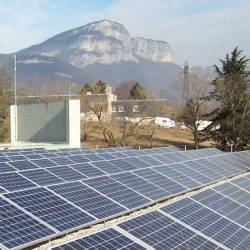 The key competencies are cooling of food, air conditioning, control of electrical motors and heating in buildings – as well as solutions for renewable energy such as solar power. K2 are proud to announce that as from January 2012 we have been appointed an official UK Service Partner for Danfoss Solar Inverters. We joined the Danfoss Solar PartnerNet as the range of Single-Phase ULX and Three-Phase TLX inverters rolled out in the UK. The Danfoss Solar Inverters have been designed to save time and costs on installation and offer optimal inverter sizing for PV installations. 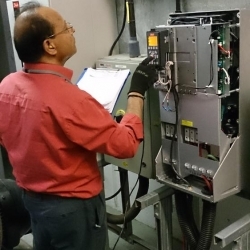 K2 Drives are fully trained and certified for servicing of Danfoss Solar Inverters. K2 have developed a range of services to ensure the increase in inverter driven loads does not impact on the UK power network. We can model proposed new loads to quantify changes to harmonic levels and plan for G5/4-1 compliance. Without disruption to site processes our snap-shot or long term surveys can be conducted to diagnose site harmonic, flicker, sag and other issues. Our reports include recommendations and remedial equipment where needed.